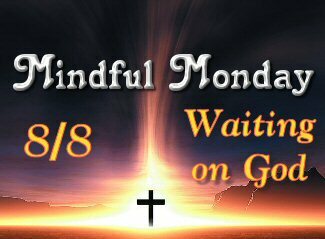 This week’s Mindful Monday devotional is about Waiting on God –a subject I’m always in the midst of learning. It was a year two days ago from the day we moved into our new house after losing the one we built and loved. I’m starting to see a few reasons the Lord allowed this to happen finally though I’m still waiting to really understand the big picture. Isn’t that the case with us all though? 🙂 We all have a thing or two we’re trying to understand in terms of God’s timing. We learn SO much about the Lord, ourselves, and His plan for us in the waiting though. As much as we hate not understanding it all right away, or getting a clear and concise answer about something we desperately want to know right away, we need to always remember He isn’t ignoring us or putting us off, but that His timing is perfect. Also, sometimes we aren’t always listening. Then there’s misconceptions we need to be aware of. That’s what this week’s devotion is really about. Waiting on God and the misconceptions we have while we wait. Recognizing misconceptions will empower us to wait well, stay present in the present, and experience God in our delay. We can redirect the negative thoughts we often receive by revisiting the moments when we sensed the Lord’s nudging. Reliving the moments of pure excitement we experienced when we felt the prodding of His Spirit will extinguish uncertainty that tries to creep in to steal our joy. We may have to travel down memory lane many times during our wait. Ashley had to make the trip several times throughout her ten-year pause, asking for God’s clarity and assurance. This is why it is so important to invite God into our wait from the very beginning, instead of after we have tried everything we know to make things happen. As we spend time with Him and in His Word, we gain confidence in His plans. A quick visit to the past fills us with the peace we need to make it through the pause. Waiting well teaches us to trust His delays rather than doubt His ways. Misconception #2: If I am waiting, I must desire something not in God’s will for my life. Samantha desired to be married. She knew God ordained and approved marriage, but did He want her to be married? There are plenty of verses in the Bible about marriage, relationships, and how to be a loving spouse. Yet Samantha also knew the verses in which Paul clearly states that some people are called to remain single. When passages seemingly conflict, it can be difficult to determine God’s will for your life. Samantha asked her family and several close friends to pray for her. She committed to taking each step she felt God asked of her—whether that was toward meeting her future spouse or remaining single. Misconception #3: If I am waiting, I must not be praying enough. Day after day, Dianna prayed and sought the Lord. Many days, she ate only one meal so her family could have all the food they needed. She watched her husband take odd jobs here and there just to make ends meet. Dianna spent weekends at the laundromat because she did not have a washer or a dryer. She fought the spirit of discouragement on her knees. She knew in her heart God would supply their needs, but she had to keep telling her head. Dianna faithfully followed the teaching of Paul in 1 Thessalonians 5:17: “Never stop praying” (NLT). Her wait didn’t end because she prayed, but her resolve strengthened, helping her to face each day. Misconception #4: If I am waiting, I must not have enough faith. This was the lie I believed as we agonized over Scott’s declining health. His faith is quiet and personal. As we lived out this mystery, I watched his discreet faith become deathly silent. His attitude toward prayer and the things of God grew cynical. While Scott’s faith is quiet, mine is vocal. When I wasn’t serving or teaching at church, I was leading women’s conferences and writing devotions and book contributions. My prayer life and Bible study were more than routine. Each morning, I had, and still have, a standing appointment with the Lord. Certainly I was doing enough work for the kingdom to get God’s attention concerning Scott’s health. All of this surely proved my faith was strong enough for the two of us and was worthy of a little healing. Here’s the thing—I should have prayed and read my Bible, but not to work my way back into God’s good graces. He is a gracious and merciful God. My praying and Scripture reading do not make Him more gracious. Somewhere along the way, I’d convinced myself otherwise. God makes us wait at times so we can glean valuable lessons. But He never does so out of spite. This is something David taught me as I continued to wait for God to heal my husband.